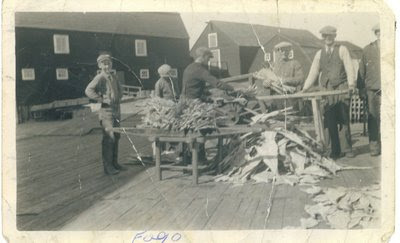 Examples of living heritage include skills like hand-building boats, homes, and furniture. HFNL is working to provide opportunities to celebrate people and their skills. Some skills and traditions were once matters of survival, like knitting woollens and preserving food over the winter. People in their homes and the homes of neighbours hooked mats, made fishing nets, told stories, sang and danced in our kitchens. These skills, traditions and crafts were not learned in schools, but learned over time in apprenticeship to senior craftspeople, or were passed down through the oral tradition. Today we look for ways to recognize and celebrate these traditions and skills. The ICH survey will be asking questions about how communities share and celebrate Intangible Cultural Heritage. Barbara Gravinese, a Memorial University, Department of Folklore Graduate Student, will be conducting this phone survey. Gravinese is writing her doctoral thesis on pottery, a contemporary tradition in Newfoundland and Labrador. “We would also like to know if there are traditions that people value and think are at risk of being forgotten or lost, as the bearers of these traditions - the fiddle maker, the singer, the cook - age and die,” says Gravinese. Gravinese will be conducting the survey with municipalities, local heritage groups and organizations over the next two months. When completed, the survey results will be posted on the HFNL website at http://www.heritagefoundation.ca/ich.aspx. For more information on the provincial ICH survey, email bgravinese@mun.ca, or call (709) 737-3582 until the 30th of September, 2008.